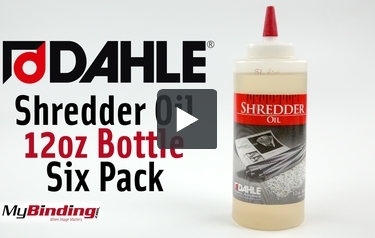 Keep your Dahle Shredder well-maintained and running smooth with this 12oz Dahle Shredder oil. Maintaining your shredder with proper oiling will keep your Dahle shredders running at optimal performance. This shredder oil is specially formulated so it won't leave any residue that could attract dust and clog the shredding mechanism. The procedure for lubricating your shredder is simple. Apply a fine stream of oil from one side of the feed opening to the other. Then run the shredder in reverse for a few seconds to help distribute the lubricant evenly. Get six 12oz bottles on every order. Shredder oil Review by Senora J. Welcome to MyBinding Video. This is the Dahle Shredder Oil 12oz. Bottle Six Pack. Keep your shredders in top working order with this great value pack. Most shredders require periodic oiling but you may be surprised to learn cross-cut shredders typically require oiling with every 15 minutes of operation. These bottles are extremely handy with their pointed nozzle and resealable cap. Whether you need to refill the oil reservoir, apply to a sheet of paper or apply directly to the cutting cylinders, this bottle makes it easy. This box includes six 12oz. bottles. For more videos and all your binding needs, visit MyBinding.com.